If you can’t squat, then you ain’t strong! That’s the consensus of most power athletes, strength coaches, fitness experts and bodybuilders. Squats build basic strength in the legs, hips and core muscles. This strength is vital to success in sports and serves as the foundation of a fit, powerful-looking physique. Squats are critical for developing running speed, acceleration power, and jumping ability. They help build a solid strength base that serves as the foundation of athleticism. The squat is the champagne exercise of weight training. How many times have you seen athletes in the gym with big arms and pencil legs who always wear sweats and are ashamed to show their legs? According to most strength experts, these people may look strong but will fold when they have to perform powerful movements on the playing field. Scientific studies show that weight-training exercises should be as close as possible to the target motor skill. Strengthen the muscles in the specific manner you want them to improve. Squats build strength from the basic athletic position— knees and hips flexed, back straight and chest out. Squats are more applicable to sports than exercises that build leg muscles in non-functional positions. Squats can be dangerous if performed incorrectly. The basic principle of all squats is to hinge at the hips and maintain a neutral spine. Most people overuse the quad muscles and underuse the larger, stronger glute and hamstring muscles when doing squats. They round their backs, which increases the risk of serious spinal injuries. Poor squatting technique puts excessive stress on the knee joints and sets the stage for a lifetime of back pain. Many people avoid squats because of reports that deep knee bends overstretch the knee ligaments. In fact, you can squat very low before the knee ligaments are stretched significantly. Good form is essential in this lift. Beginners often use too much weight; consequently, they bend their backs excessively during the lift and sometimes get injured. There is more to squats than putting a bar on your back and bending your knees. 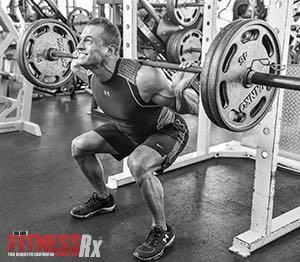 Performing the many different varieties of squats will build rock-solid base strength, core fitness and whole-body power. Squat exercises include back squats, front squats, overhead squats, box squats and power rack squats. Each adds another dimension to lower body strength and power.